You’re maturing from a memory to a legacy. Not complaining, living better in a time capsule. According to Bernoulli’s principle, when an incompressible fluid passes from a large area into a smaller one, as when a wide pipe funnels into a narrow passage, the fluid’s velocity rapidly increases. That idea has dozens of practical uses, from the operation of airplane wings to the function of your automobile’s carburetor. It’s a key part of computer production and the basis of cutting-edge work in the field of hydraulics. And, as strange as it might sound, the legacy work of 18th century European mathematician Daniel Bernoulli also adequately describes the process behind and product of Moms, the fifth and best album to date by Portland’s Menomena. 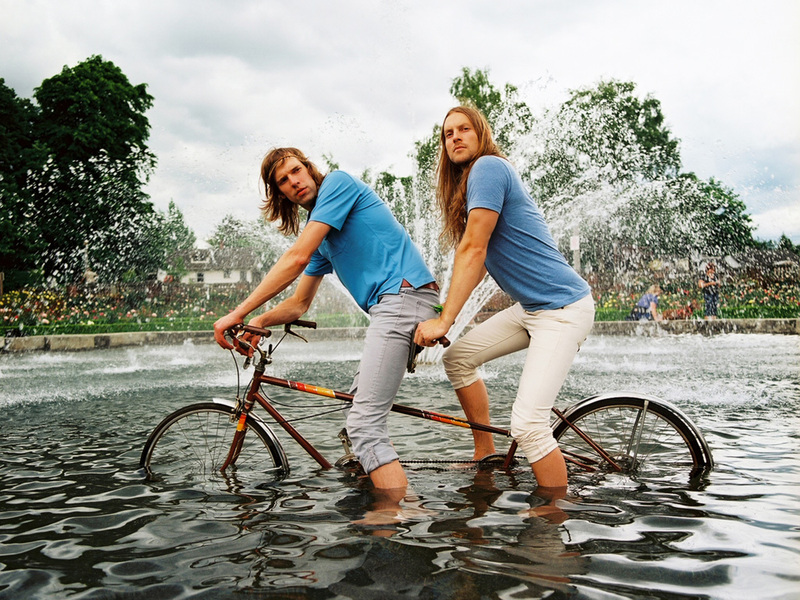 During the last decade, Menomena has become its own reference point. From hooks wrapped around plummeting baritone saxophone lines and nearly inhuman rhythms to serpentine lyrical frameworks and high-concept album art, Menomena has established a singular and unmistakable aesthetic. No one else sounds quite like this band. They embed magic and mystery within pop songs that have never sat still or taken the path of least pressure, just as Bernoulli would have had it. Since 2010’s irrepressible and intricate Mines, though, the pipe has narrowed: Menomena co- founder Brent Knopf took his leave to focus on his solo project causing Justin Harris and Danny Seim— close friends since high school and now well into their second decade of making music together—to recast Menomena as a duo. As science might have predicted, they didn’t slow down; they actually sped up, writing, recording and releasing Moms with more focus and speed than ever before. Harris and Seim didn’t invite loads of friends or collaborators to replace Knopf; they made these songs as a duo, intent on proving—directly to themselves, and by extension, to everyone else—that Menomena essentially remains the same brazen band responsible for Friend and Foe, Under an Hour and all the gut-punch, pop-ambition moments therein. They added new instruments, like flute, cello, more of Seim’s synthesizers and the tap-dancing that actually laces through the teasing-then-charging opus, “Don’t Mess with Latexas.” For the first time, Harris and Seim, who each contribute five songs here, talked about what they were writing, too. Seim explored the death of his mother when he was but a teenager, while Harris investigated the way his own family dynamic—a single mom, with a departed dad—left indelible impressions on everything he’s done since. The album’s pieces connect, then, addressing how people must rise to face or flee circumstances beyond their control. It’s perhaps the most appropriately imaginable prompt for a band whose last two years have depended upon their ability to explore, adapt and improve. The result, Moms, is tragic and intimate, comic and endearing, personal and motivated. In 10 songs and just less than 50 minutes, Harris and Seim cast pop cascades into noise kaleidoscopes (“Baton”), chop and twist a melody until it becomes a big dance beat (“Capsule”), and build inescapable arrays of tension and texture that finally release (“Tantalus”). Opener “Plumage” couples its surge of energy with a cleverly playful study of sexuality, while “Pique” turns the same sort of seemingly impossible tessellated-rhythm tricks that have become a Menomena trademark. At the close of it all, the slow strangle of “One Horse” arrives as the most poignant moment yet in Menomena’s catalogue, piano plinking and strings sliding beneath Seim’s existential evasion. It’s the perfect summary statement for Moms, an album that explores both a new vulnerability and resiliency within Menomena, a duo that’s taken change not as an excuse to opt out but instead as a catalyst for growth. Moms was released on September 18th, 2012 via Barsuk Records.